"There’s no shortage of books featuring "cultural history" and other quasi-sociological surveys of this terrain, but Lamb-Shapiro’s take is different. Part experiential journalism, part memoir, Promise Land is both funnier and more searching than detached forms of social commentary could ever hope to be." "Promise Land is very much a book of the publishing zeitgeist—the gimmicky premise, the mash-up of genres—and risks coming off as clichéd. But Lamb-Shapiro’s authorial presence rescues it from that fate. Her approach to the material is skeptical but not cynical; her personal disclosures feel generous rather than exhibitionistic; and she writes in a mordant, deadpan voice with impeccable economy and timing." "Jessica Lamb-Shapiro has an unusual relationship to the self-help industry: her father is a child psychologist who has authored numerous books on the subject. Lamb-Shapiro’s inherent ambivalence is at the heart of Promise Land: My Journey Through America’s Self-Help Culture, in which the author immerses herself in the world of seminars, mantras, and self-improvement, all the while exploring the nation’s enduring fascination with perfection. By turns funny and sad, the book is, ultimately, a deeply personal story—and a really good read." "A sincere and hilarious picture of the personalities and ideas found in this field of self-promotion and discovery. . . . Lamb-Shapiro’s journey through self-help culture fascinates and entertains, and as much as it also serves as a quasi-memoir, it excels." "A brave, personal book in which the author discovers the best of the self-help industry, despite its many flaws." "With mordant wit and spectacular bravado, Jessica Lamb-Shapiro deconstructs not only the ludicrous self-help industry, but also the infinite personal vulnerabilities that it exploits. This is a knowing, insightful, and delightful book." "Here are two important self-help rules. Buy this book. Read this book. You’ll feel better about yourself and the world. Promise Land is funny but not sneering. It’s poignant but not maudlin. It’s smart but not pretentious. This is gazpacho for the soul, which I much prefer to chicken soup." "Promise Land is not only a raucous, engaging account of all the hope, despair, faith, fear, falsity, and truth that comprises America’s centuries-old obsession with self-improvement. It is also a deeply felt personal story about family, secrecy, and grief. Read it and you might just find yourself improved." "I can’t think of a nonfiction writer since David Foster Wallace as adept at pivoting from slapstick linguistic virtuosity to whip smart analysis to incomprehensible pathos—at times, all within the same paragraph! 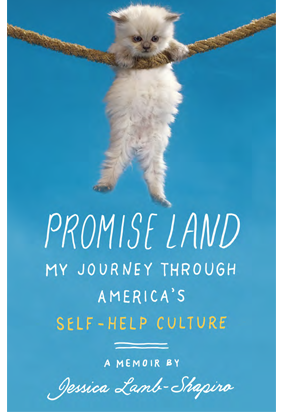 The druids of our contemporary self-help culture will need to write a new ‘Chicken Soup’ book to soothe their own souls if they accidentally read Jessica Lamb-Shapiro’s epic, hilarious Promise Land. Everyone else will just be delighted."